The collaborative painting Robin: A Spark in the Dark was created by the seven-member Bay Area Studio Artists as a signature piece for a show called Light <---> Dark. Our goal for the show was to present a meditation on the light and dark patterns and balances that make a painting intriguing, compelling and dramatic. As we began to think about a group work to illustrate this idea, we realized there was another kind of light and dark in our emotional lives. And as we discussed this we thought of Robin Williams, whose death had touched us all. He seemed to embody the brightest of light moments as well as the darker side of reality. The resulting portrait we created is painted on 24 - 10 x 10 inch canvases. The seven artists were randomly assigned three or four pieces of the painting. The canvases, painted in acrylic or oil, represent the BASA artists' eclectic mix of styles from realism to expressionism. We like to think the resulting work reflects the mix of realities that were always part of Robin's personae. Artists participating in BASA include - Suzun Almquist, Marcy Wheeler, Jeanette Baird, Joanne Taeuffer, Susan Bonebakker, Sharon Tama and Ellen Reintjes. 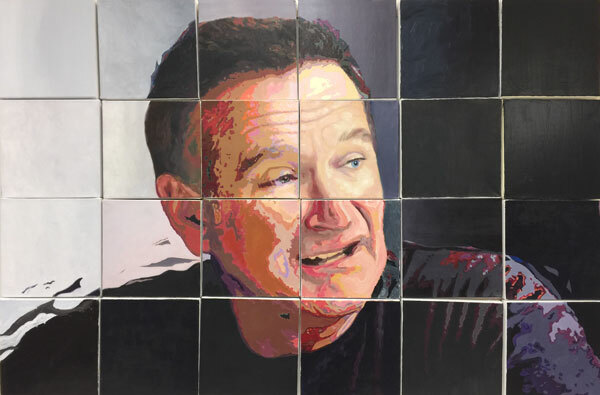 Yesterday, August 11th marked the one year anniversary of Robin Williams passing. from August 19 - October 4, 2015. And at the Marilyn Citron O'Rourke Art Gallery in Benicia from Oct. 12 - Nov. 20th.